Sinusitis is an infection of the spaces in the bones around the nose, also called the sinuses. This infection causes inflammation in the membranes that line the sinuses. Sinusitis symptoms include tenderness in the face, aching behind the eyes, sinus congestion, difficulty breathing through the nose, headaches, fever, reduced sense of smell, aching in the jaw or teeth, bad breath, and ear pain. 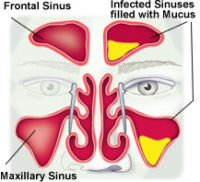 Sinusitis is generally caused by bacteria, viruses, or fungi. Sinus infections are acute, lasting for up to a week, or chronic, which may require treatment over a prolonged amount of time. With chronic sinusitis, more severe symptoms may result, as the infection may spread to the bones in the skull, eye, brain, and may cause an abscess or blood clots. Sinusitis is often caused when the sinuses cannot drain, and mucus builds up, leading to favorable conditions for bacteria, viruses, and fungi. Mucus builds up when the small openings in the nose, called ostia, become blocked. Usually, ostia become blocked when an individual is suffering from a head cold or has allergies. Other causes include nasal polyps, dental abscesses, swimming or diving into infected water, overuse of nasal decongestant sprays, altitude changes, having a deviated septum, or getting a foreign object lodged in the nose. Avoiding colds is a good step towards avoiding sinusitis. This is most easily done by frequently washing one’s hands, not smoking, and avoiding secondhand smoke. Eating a healthy, balanced diet also aids individuals in avoiding colds. Doctors recommend that individual eat a diet high in antioxidants such as fruits and vegetables. Individuals should drink plenty of water each day, as this allows mucus to move freely in the sinuses, avoiding clogs. Smoking or inhaling secondhand smoke also increases the risk of upper respiratory infections and allergies, which can in turn cause sinusitis. Doctors also recommend that when an individual blows their nose, they do so in a gentle manner, and only blow one nostril at a time. Blowing the nose too hard may result in nasal inflammation, which can lead to a sinus infection. Sinusitis may also be prevented by avoiding respiratory allergies. If an individual suffers from an allergy, they should identify the allergy and then avoid the offending substance, if possible. Additionally, chronic sinusitis is often linked to food allergies. If the individual is able to find the offending foods, they may be able to prevent chronic sinusitis. This is best done with the help of a doctor, who can aid the individual in using an elimination diet to identify the foods causing the allergy and subsequent chronic sinusitis. Changes in an individual’s environment may also be able to help prevent sinusitis. It is recommended for individuals with chronic sinusitis to keep a humidifier in their bedroom during the winter months to keep nasal passages moist and resistant to potential infections. Flying or scuba diving should be avoided when dealing with a respiratory infection or allergy, as changes in air pressure push mucus up into the sinuses. If an individual must fly, they should use a decongestant before flying and then use a nasal spray after landing. Sinusitis symptoms can include nasal congestion, headache, tooth pain, jaw pain, green discharge from the nose, fever, headaches, bad breath, and ear pain. While doctors can usually easily diagnose acute sinusitis, chronic sinusitis may be more difficult to diagnose, as its symptoms are similar to those of colds or allergies. If diagnosis based on symptoms and medical history proves too difficult, a doctor may perform a nasal endoscopy, which involves using a thin, flexible tube with a fiber optic light on the end to look at the inside of the sinus passages. This may also be used to look for structural blockage, such as a deviated septum, which may be the cause of chronic sinusitis. Hydrotherapy, wherein an individual alternates pressing hot and cold compresses on their sinuses, may help to reduce congestion and pain related to sinusitis. Usually, three minutes of hot compress should be followed by thirty seconds of the cold compress, and the cycle should be repeated three times. Acupuncture is recommended by the World Health Organization as a treatment for sinusitis. Massaging the feet may also provide relief. Vitamin supplements may help ward off infections, and Vitamin C, beta carotene, zinc, and quercetin are recommended. Garlic (Allium savitum) and onion (A. cepa) are two herbs that have been proven to help aid in preventing the infections that can cause sinusitis. These can be taken in capsule form, or using them in food. Goldenseal (Hydrastis Canadensis) is also recommended for treating sinusitis, as it has two active parts called berberine and hydrastine that fight acute bacterial infection. Echinacea is another herb that is effective in treating bacterial infections, and was used by Native Americans for that same purpose. Studies by German doctors have confirmed that Echinacea stimulates the immune system, and helps the body quickly fight off bacterial, fungal, and viral infections. Essential oils from eucalyptus (Eucalyptus globulus) or peppermint (Mentha piperita) may help relieve sinusitis. The oils should be diluted with vegetable oil and then rubbed on the forehead or temples. Individuals may also put the essential oils in bathwater to help relieve sinusitis. Care should be taken to dilute the essential oils, as they can be toxic in even small amounts. If the oils are not readily available, mint leaves may be crushed and applied to the sinuses, or brewed into a tea. The bruised leaves of a eucalyptus tree may be used in a similar fashion. Oregano (Origanum vulgare) has powerful antiseptic properties, and may be infused into a tea or applied to the skin as a lotion after adding the essential oils of oregano to lotion or vegetable oil. Gingko (Gingko biloba) is an herb that has respiratory benefits which can help treat or prevent sinusitis. Individuals should be careful when using Gingko, and look for a 50 to 1 ratio, carefully following packaged directions. 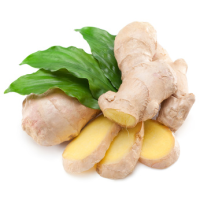 Ingestion of too much Gingko may cause diarrhea, irritability, and restlessness. Horseradish (Armoracia rusticana) may be used to clear the sinuses and prevent infection.